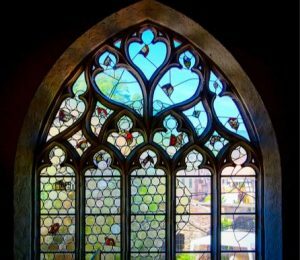 What’s the difference between stained glass and leaded glass? Oftentimes, people use these terms interchangeably and that’s fine, though industry insiders would differentiate them in one major way: leaded suggests no color is involved while stained implies color. Makes sense, doesn’t it? Whether or not your glass is clear or stained, one thing is for sure: today there are a wide variety of styles and designs available for both… indeed, sometimes clear and colored even get mixed for a nice effect. You might be wondering what’s popular where, right? Well, leaded glass is more popular in people’s homes and businesses while stained (colored) glass is more popular in churches. If and when there’s an artistic scene to be expressed using glass, that’s when full color comes into play– think of Jesus’ Nativity scene with the manger, shepherds, animals, etc. Otherwise, if it’s just a repeat of simple shapes like circles or rectangles to give a window a distinct look, then leaded glass works just fine. Did you know there are specific leaded designs, such as “chord” (vertical lines), glue chip (which looks like ice crystals have formed on the window) and waterglass (a wavy look)? Do some research online before you decide to buy stained or leaded glass and you’ll be impressed with the various creations makers have come up with in recent times. Both stained and leaded glass add value to a home, business or church. Think about it: the more elaborate the windows, the more “special” they are to a place, such that people come from both near and far to admire them over the years. Indeed, there are many churches with gorgeous stained glass windows, which become a bit of a tourist draw in and of themselves. Cumberland Stained Glass of Mechanicsburg, PA, can design, install, repair and/or restore both stained and leaded glass. From businesses to house of worship, Cumberland serves a wide variety of clients. Want to see some examples of our work? Visit here for religious windows and here for residential windows. If you have any questions, don’t hesitate to call Cumberland Stained Glass at 717-691-8290 or email [email protected].